Your customers can't miss making a stop at your concession stand once they see crispy nachos, freshly-popped popcorn, or roasted peanuts on display in this Paragon 2190210 15" merchandiser! This unit doubles as a merchandiser and a warmer, as the stainless steel warming deck features a heating element underneath. Since it warms from the bottom up, your product will stay warm and fresh for longer periods of time. 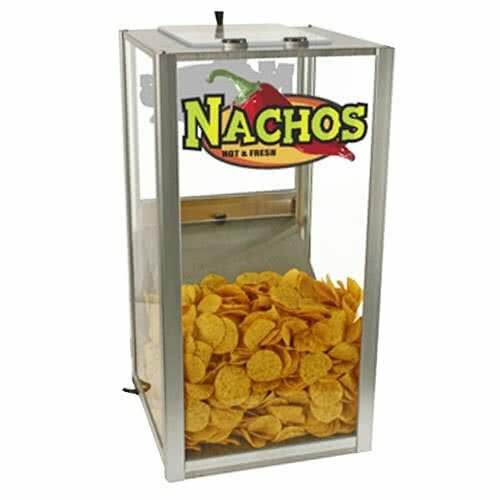 The clear plexiglass lid and tempered glass side panels provide excellent visibility of your hot and fresh concession foods. Not only that, but this unit includes decorative decals in colorful designs that are sure to catch any customer's eye as they're walking by.